Farrar, Straus and Giroux (BYR), 9780374388294, 448pp. Sixteen-year-old Canny Mochrie's parents go away on a vacation, so they send her off on a trip of her own with her step-brother Sholto and his opinionated girlfriend Susan, who are interviewing the survivors of a strange coal mine disaster and researching local folklore in 1959 Southland, New Zealand. Canny is left to herself to wander in a mysterious and enchanting nearby valley, occupied almost entirely by children who all have the last name Zarene and can perform a special type of magic that tells things how to be stronger and better than they already are. With the help of a seventeen-year-old boy who is held hostage in a hidden away house by a spell that is now more powerful than the people who first placed it, Canny figures out why she, too, can use this special magic that only Zarenes should know, and where she really came from. 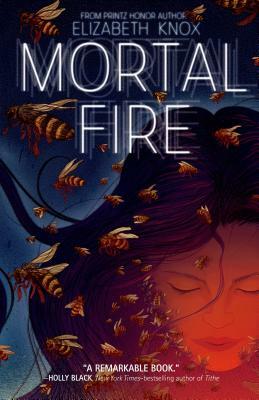 Printz Honor author Elizabeth Knox has created another stunning world of intrigue in Mortal Fire. Born in Wellington, New Zealand, Elizabeth is the middle of three sisters. The Knox family moved around a number of times during Elizabeth’s childhood. They lived in Pomare, Wadestown, Waikanae, and Paremata. The sisters were close, and always played imaginary games. By the time Elizabeth was eleven, the games had become one game, an ongoing saga set in another world -- a game she shared with her sisters and several friends. One day, when Elizabeth was sixteen, her father interrupted a discussion the girls were having about the possible results of a secret treaty and said, “I hope you’re writing some of this down.” The idea hadn’t occurred to Elizabeth before, and she thought it was a very good one. She, her sisters, and friends began writing letters between their characters and stories about them. Elizabeth enjoyed writing and decided that this -- writing fiction -- was what she wanted to do with her life. When Elizabeth left her secondary school, Tawa College, which she attended from 1972 to 1976, she took a job as a clerk in the Inland Revenue department in Porirua. While workmates her age were saving for cars, weddings, and overseas travel, Elizabeth saved in order to take eight months off work and write a novel. This first novel, One Too Many Lives, completed when she was nineteen, was not to be published (though there was kind interest from a number of publishers in New Zealand and the UK). Again Elizabeth went back to work to save money, and at twenty-two took another year off and wrote another novel, Salamander, which she disliked and put away. In 1983, Elizabeth went to Victoria University and began a degree in English literature. In 1984 she took Bill Manhire’s Original Composition course and began writing After Z-Hour. Bill Manhire encouraged her to finish it (actually, he told her he’d rather see her finish her novel than her degree). After Z-Hour was published by Victoria University Press in 1987. The same year, Elizabeth graduated from Victoria University with a B.A. in English literature and was awarded the ICI Young Writers Bursary (now the Louis Johnson Bursary). Elizabeth Knox has been a full-time writer since 1997. She has published eight novels and three autobiographical novellas. Her best-known book is The Vintner’s Luck, which won the Deutz Medal for fiction in the 1999 Montana New Zealand Book Awards and the 2001 Tasmania Pacific Region Prize. The Vintner’s Luck has been published in seven languages and is being made into a film by Niki Caro (Whale Rider; North Country). Elizabeth’s most recent book, Daylight, was short-listed for Best Book in the South Pacific & South East Asian Region of the 2004 Commonwealth Writers Prize. Elizabeth’s first book for young adults, Dreamhunter: Book One of the Dreamhunter Duet, was chosen as a White Raven by the International Youth Library, and is the winner of New Zealand’s prestigious Esther Glen Medal. Its sequel, Dreamquake, will be published in March 2007. Elizabeth lives in Wellington with her husband, Fergus Barrowman, and their son, Jack.